The campaign season is getting hotter. Griggs took his turn on EarBurner this week, discussing such topics as the Margaret McDermott bridge, the Angela Hunt and Methodist Hospital thing, boxing (he used to do a little of it, but somehow doesn’t like Errol Spence), and Jim Schutze’s coverage of him. Ok, he didn’t so much talk about Schutze, but he was asked about him. He also chatted about VisitDallas, continuing his staunch disapproval. You know who hasn’t given any money to Griggs? The Hotel PAC. You know who gives a lot of money to the Hotel PAC? VisitDallas. That PAC has backed a lot of other mayoral candidates, which makes VisitDallas’ denial this week that they’re impacting where PAC funds go appear fishy. 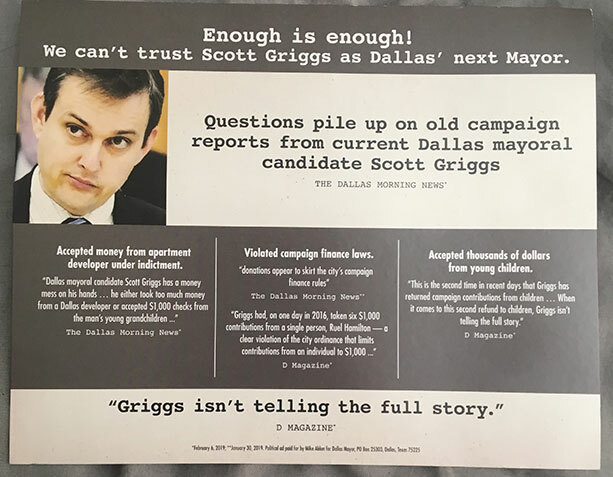 And then, today, the Dallas Fire Fighters Association threw its endorsement behind Griggs. Jim McDade, the organization’s president, said in a statement that Griggs stands out with “an invigorating, new plan to push Dallas forward.” The police association is waiting for the runoff to make an endorsement.—S.S. Ablon came up in this Gromer Jeffers story as someone who will benefit from the increased turnout in District 13, where Laura Miller and Jennifer Staubach Gates are having an, um, spirited contest. Ablon lives in the district and is active there; his campaign has also targeted the voters there, many of whom, Jeffers notes, probably actually watch the commercials and have seen his. 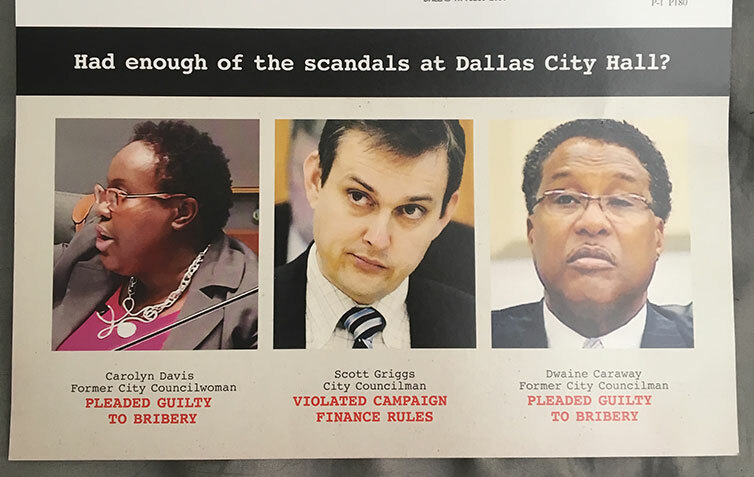 His campaign also sent out some spicy mailers attacking Scott Griggs, grouping him in with the admitted criminals Dwaine Caraway and Carolyn Davis. They accepted bribes. He had some questionable donations from children and a developer who was later indicted. Not the same thing, but this is politics. In the tiny font at the bottom of the mailer? “Political ad paid for by Mike Ablon for Dallas Mayor.” — M.G. Solis’ campaign premiered their first TV spot today, which opens with his daughter who received a life-saving heart transplant and ends with the candidate promising universal pre-K and improved job training. Solis, a former Dallas ISD trustee, is uniquely positioned in the race to focus on education, which in almost every municipal race is a priority for voters. I want you to know how personal this campaign is for me. The Dallas community helped my family and me through the darkest moment of our lives, and I will never forget that. He spent the weekend block walking in North Dallas and held the campaign’s 64th small meet and greet. — M.G. McBee was another candidate who Jeffers said should benefit from the D13 turnout. Her math checks out like Ablon’s: lots of money, appealing to older voters who will actually consume your campaign advertisements. Her campaign seems like it’s humming along. She had a good showing on EarBurner, in which she supported both removing IH-345 and exploring privatizing DFW International Airport and Love Field. — M.G. Johnson came up in Albert Black’s run on EarBurner. Black says Johnson used to think of him as family, like a second father. The state rep. was at Black’s son’s wedding, in fact. And then Johnson made a late entrance into the mayoral race. Black calls the current iteration of Johnson a “puppet.” “And, quite frankly, my attitude is what it is because my feelings are hurt. My feelings are hurt. He did not have to start a Civil War.” If we get a response from Johnson, it won’t be on the podcast; he’s the only candidate to turn us down. Elsewhere, the DMN wrote about Johnson’s legislative efforts to require school districts to report demographic data about suspensions. And Johnson’s campaign posted his 1994 graduation speech from Greenhill. —S.S. Montoya was on the podcast this week. It’s interesting. These conversations, of course, are meant to be pretty relaxed, certainly in comparison to candidates’ normal speaking engagements. That’s part of the fun. But Montoya politics as hard as anyone in this thing. And throughout the half hour, it never really seems to turn off, or even tone down. That’s not to say the discussion isn’t revealing. Montoya seems skeptical of an I-345 teardown, although she admits to being under-read on the subject. She’s untrusting of the narrative of Dallas’ booming growth, saying that what people are really talking about is the growth of Dallas-Fort Worth. And, of course, poverty is the biggest issue of all for the former chair of the Mayor’s Task Force on Poverty, although that doesn’t mean she dives into the complexities of things like, say housing policy. She talks a lot about jobs, about community resources such as libraries, and about meeting residents at their needs with things like certificate programs for folks who may not want or need to go to college. —S.S. Kennedy’s campaign manager tells me she’s been out of the country, speaking on a panel about women’s rights and then attending an international book fair in Iraq. —S.S. Correction: Johnson was not in the wedding of Tre Black, Albert’s son. He attended, and Albert misspoke multiple times.